The Chocolate Snowman Murders by JoAnna Carl, a Mysterious Review. 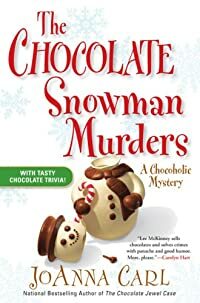 Review: Both chocolate shop manager Lee McKinney and her husband Joe Woodyard are implicated in the murder of a visiting art critic in The Chocolate Snowman Murders, the eighth mystery in this cozy series by JoAnna Carl. WinterFest is the social event of the season for Warner Pier, the small resort town on the Michigan shore of Lake Michigan where TenHuis Chocolade, the chocolate shop for which Lee works and which is owned by Lee's aunt, is located. A major event during WinterFest is the annual arts festival drawing major artists and critics from around the country. When one of the judges of the festival has to drop out, the organizing committee recruits retired art professor Fletcher Mendenhall to be a juror. Lee is assigned to pick him up at the Grand Rapids airport but once there, he starts to make unwanted moves on her. She promptly dumps him at a local motel, returning home alone. When Joe goes to pick up Mendenhall the next morning, he's found murdered, his head bashed in. The police at first suspect Lee (being the last person to see him alive) and then Joe (the presumably jealous husband), but for lack of evidence they are released. When Mendenhall's missing cell phone turns up in Lee's jacket, she's the center of attention again. Later when the festival's public relations director found with her head bashed in, and the murder weapon found in Lee's car, she knows she's being framed and sets out to prove her innocence. The Chocolate Snowman Murders is a pleasant if predictable mystery. Although the book probably doesn't have any more or less dialog than any other cozy, it just seems chatty, as if someone is always speaking. And as is typical when someone prattles on and on, it's not always interesting and it's fairly easy to tune it out. Still, the plot moves along at a brisk pace and there is no shortage of suspects for Lee to investigate. Subtitled "a chocoholics mystery", there is actually very little chocolate mentioned and it certainly isn't integral to the plot (though it does play a role when Lee defends herself against a mysterious attacker). The infrequent inclusions of chocolate historical trivia are, however, a welcome addition, informative and entertaining. Acknowledgment: Penguin Group provided a copy of The Chocolate Snowman Murders for this review.